Earlier this year the Friends of Millwood & Alderwood helped the Woodland Trust to advertise the help they give to groups with grants by interviews both on Radio Merseyside & in the Liverpool Echo. The Friends were successful in securing a grant that has enabled us to carry on working with the local Schools & The Venny again. Children were able to go back to see the fruits of their labour from when we worked with them last year. 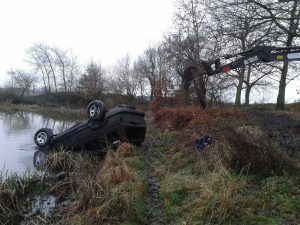 There are always on going jobs to be done one of the worst was removing a car from the pond and other cars off the pathway. With the hard work of Lancashire Wildlife Trust and some heavy duty machinery thankfully they got them out. There was a few feet long Eel living in it along with other pond life. The Friends group has been going out into the local community to events that other groups & local authorities held to encourage more people to come along and use the woods. The first was in Garston Urban Village were we got people to make bird boxes, seed balls, planted wildflower seeds, and gave out our leaflets. It was a really wet & windy day so everyone had to stay inside. It was nice chatting to other groups and finding out what they do. Members from Earthworks & the Millwoods walking group & Mersey Forest also attended on that day. The Venny had an event that was a really busy day the group ended up running out of wood for the bird boxes and seeds for the balls so we had to finish up early as it started to pour with rain. Through going there we got invited to go along to other events. We went to the Palm House in Sefton Park with Five Families and that day we along with Mersey Forest just did plant pots. It was mostly toddlers & it was surprising as they didn’t want to wear gloves unlike older children who are mostly frightened of getting their hands dirty. It’s a lovely sunny day after the storm yesterday. Sat looking at my daffodils in the sunshine makes you think that Springs on the way after all the dull grey days. The Lancashire Wildlife Trust has been doing a splendid job on the trenching. 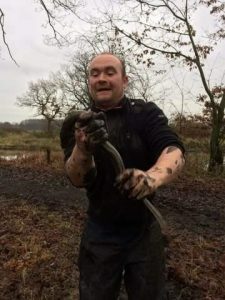 They have also done work on the fishing pegs that were sinking while tidying the pond they found a large eel it was a few feet long. They are still working away in the woods hope the weather improves for them. United Utilities should be back soon to finish the work on the Sludge pipe & they will be making good the pathways. Which will make it easier to get around. Especially be good for the local walking group run by Katie Miller, that runs from The Place to Be Café in Eastern Ave, Speke on Friday mornings at 10am in term time. We are having more planting & den days with the local schools & the Venny playground. Plus project days anyone can come along to & join in. As soon as we get the dates from Earthworks I will put dates on here. We have a lot of upcoming projects with Mersey Forest coming up. Survey of some of the birds and animals living in the Millwood. Here is an outline of some of the birds living in Millwood, I wonder how many you can spot or some we have missed. There are many varieties of insects, fishes, plants, flowers and fauna. They will keep till another day. Enjoy your visit to the woods, be careful when all the work starts. Walking for health oranisation will be doing walks around Millwood, commencing friday 9th September, every friday morning during term time at 10am from The Place to Be Cafe, 10 Eastern Avenue, Speke, L24. Everyone is welcome to join. the walk leader is Kathryn Miller. Work to start on sludge pipe, plus project work. The work due to start on sludge pipe in Millwood was suspended due to United Utilities doing a survey for Great Crested Newts. The work is now due to start in first or second week of September so the green gate will be blocked off for the duration of the work. A bridge will be put in further along the pathway for people to be able to enter the woods. Also Lancashire Wildlife Trust work will start on project, clear pathways, clear around the pond as well as the flowpipe. cutting trees back especially any dead ones. put more trenches in around the perimeter. do more planting of shrubs and wildflowers. Please be careful going around Millwood as work is been undertaken by United Utilities on the Mersey Valley Sludge Pipeline which needs replacing. So there will be 30 ton diggers going up and down pathways for next 6 months at least.